It was a big mess when we were putting together the computer systems. I talk to a lot of independent owner operators every day. I find out how they’re doing, what’s going well, what they could use some help with. What I find interesting is how in all the years I’ve been doing this, I’ve only ran into one trucker who full-heartedly enjoys filling out those pesky packets. As of this writing, we’ve been in business just under six years and in all these years, I’ve only met one such person. We spoke last week. He hauls freight for pleasure. It pays for the cost of going on vacation. He enjoys the work, he doesn’t mind the ELDs, he’s an older gentleman who’s not really doing it for the money. He loves the freedom and the work that he does. I can’t help such a person. If you’re like his gentleman, please don’t call us hahaha. Who we can help are the independent owner operators and small fleet owners. We run a true dispatch office with dispatchers who are constantly trained and monitored. Everyday my dispatchers are getting better and better. Their performance translates into your bottom line. This is a 49-inch screen running at full 4K at 60Hz hooked up to a 7th generation Intel i7-7700K water-cooled processor. This is in my home-office. Believe me, performance matters when good loads are booked in 10 seconds. I personally spec’d out the computer parts and put them together. I designed these systems specifically for dispatch office use. My dispatchers sit in front of 40-inch 4K monitors using live load boards, direct freight shipment emails for loads that never go on load boards. My dispatchers know markets, pricing, commodities, weight, temperature, and they know how to use this information to drive the price up. A higher price benefits everyone of us. Dispatch trucks is all that my dispatchers are responsible for. They don’t take care of the packets or insurance calls. They focus on better understanding freight market dynamics, negotiation skills, planning, and salesmanship. One angle of one of the cubicle rows in our dispatch office. We were just moving in when this picture was taken. The packets and insurance certificates still get taken care of but we have an admin staff for that. These people specialize in handling paperwork as efficiently as possible. Their computer systems differ from the dispatchers as they mainly focus on completing large PDF documents which need a very different type of system. We have that as well. Once our clients (trucker drivers) deliver the load and send us the signed BOLs, our staff starts working on billing and invoicing the broker or getting these documents over to your factor (if you use one) along with the necessary Notice of Assignment (NOA) and Schedule of Accounts (SOA). While this is happening our dispatchers are busy looking for another load. Most likely they already had one pre-booked for you the day before. You keep putting on those miles and depositing those checks. All rate confirmations always go in your company name and never to AFT Dispatch. These are your loads and they should go under your authority. We’re building your business and setting you up with new brokers every day. Another angle of the dispatch office floor layout. Everything is furnished now, computers and screens in multiple spots. Every quarter we’ll also send you quarterly statements which will show you all the details for all the loads you’ve done with us. This will only make your quarterly IFTA filings easy. It will also make your annual State and Federal tax filings a breeze. Your CPA will thank you for it. We’re all about transparency and I believe every company owner should know where they stand financially. As always, you’re more than welcome to call us with any questions you might have. See our sales landing page for more details on how AFT Dispatch can help make your trucking life much easier and more profitable. Our phone number is (801) 448-6363 and you can also write your questions in the comments section below. 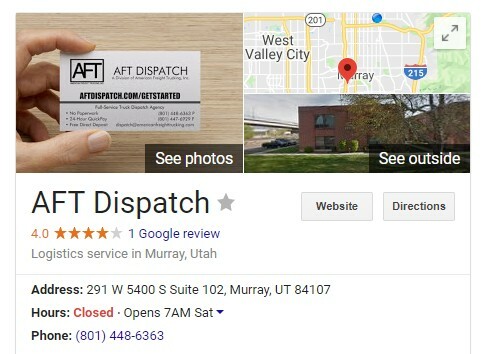 This is what you’ll see if you Google “AFT Dispatch”. Call us at (801) 448-6363 or get started on our website.